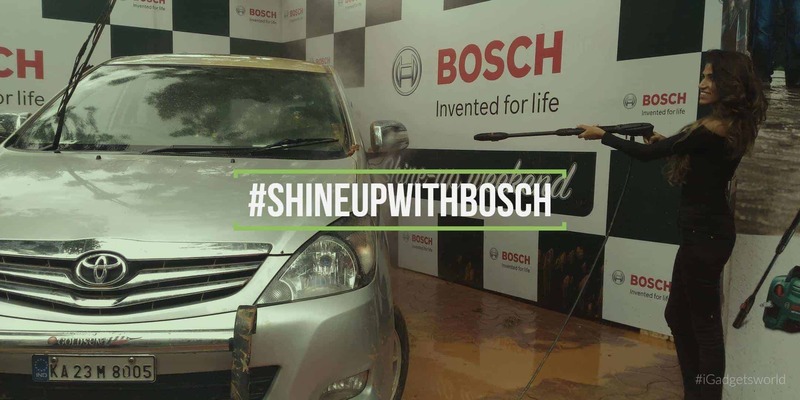 If you are an avid follower of iGadgetsworld, you must have known that we were at the #ShineUpWithBosch event on last Saturday in Bangalore. Many of the bike & car enthusiasts were at the event to witness the power of 3 new high-pressure washers from the Bosch. Initially, we were all given some safety clothes & a jug of mud water :p to throw on 2 cars & a bike. Yeah! I am serious, this is what we did during the event startup. After covering everything from mud water, we were asked to wait, so they can show the magic of these new 3 high-pressure washer products. Mr. Panish PK, Regional Sales Director and Business Head of Bosch unveiled the 3 new high-pressure washers – HPW AQT 37-13, HPW AQT 35-12 and so on! We make products just for people (consumers) like you, instead of trying it our self, we want you to try, so we can know what’re the pros & cons of our products. I feel this is what Bosch is thinking to give us a chance at the first place itself. Before testing the product live, they asked us how we usually clean our bikes and most of us replied back with a bucket of water and a cloth. There was a small debate on how hard is to use the traditional ways to clean things which not only kill our time but also get us severe back pain. Then, they told us – ‘Try it live & see the magic for yourself’. The new high-pressure washers might look bulky & you may think they weigh more, but to be honest, they are very light weight. Easy to lift & compact, can be carried to any place very easily. As said, everyone of us queued to test the high-pressure washers live & see if they can really remove the stubborn dirt from cars & bikes? Initially, we started with HPW – AQT 35 -12 with a normal handle & high-pressure foam nozzle. 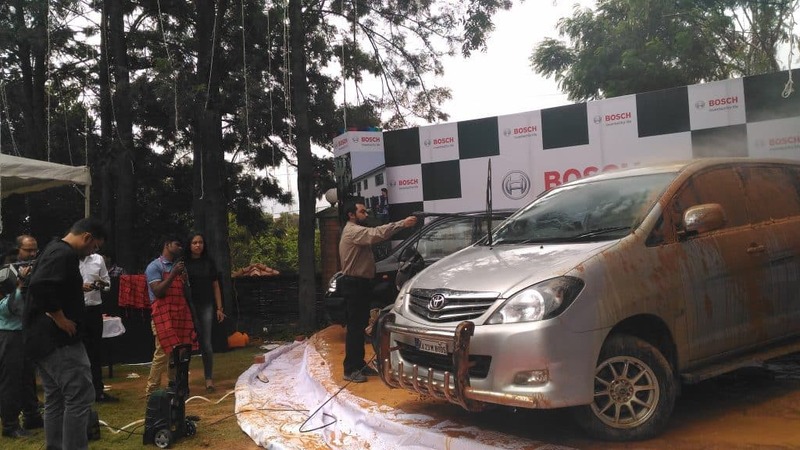 Slowly, the participant started to point the water gun towards the dirty car and just like they said, the stubborn dirt is fading away! It’s simply like a magic with these power tools. We were also provided with the 900 nozzle which helps to remove dirt from the places where we generally can’t reach. Everyone of us had a try & simply made the dirty cars into brand new cars, just in 15 minutes. To conclude this article in one line, we witnessed a real magic & were offered to try everything at first place, we actually gave a demo to the brand itself: p instead of the opposite. For more information about the high-pressure washers, you can visit here!